Rent a 2019 Honey Tangerine Tree! Share in the harvest of Honey tangerine! Tree-ripened, hand-selected & shipped at the peak of perfection. Unbeatable in taste and ever so sweet & juicy. The grove is located in the famous Indian River region of Florida, noted for its ideal climate for growing the best citrus fruit. Rent a Honey tangerine tree for someone who would enjoy a Honey tangerine from their own tree. A relatively new variety of Florida citrus is the Honey Tangerine! Being as sweet as honey and full of vitamin C, demand has always outstripped supply. You can reserve one of these special trees for yourself or as a gift, and bring Florida to your (or your recipient’s) door. 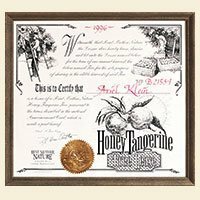 Treat a friend to the harvest from their own honey tangerine tree, which stands in a small grove within the famous Indian River region of Florida. Unbeatable in taste and ever so sweet & juicy, these premium honey tangerines are hand-picked & shipped at the peak of their tree-ripened, in-season perfection. Sorry, Florida Citrus can’t be shipped to Alaska or Hawaii. These were the sweetest tangerines I ever tasted. Keep up the good work.